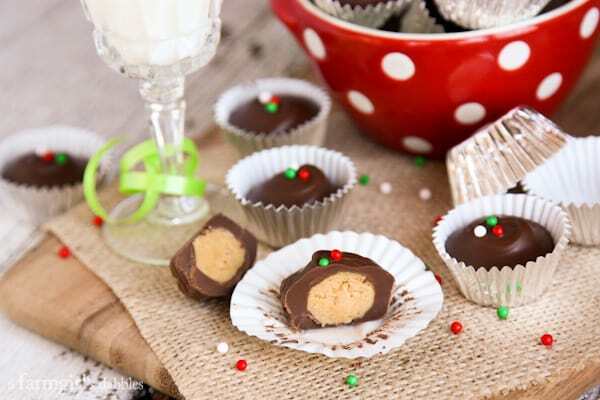 I’d take one of these Homemade Peanut Butter Cups over the store bought version any day! My Mom’s Homemade Peanut Butter Cups are the best. But you already knew I’d say that, right?! I know that there are a zillion and one recipes out there for homemade peanut butter cups, but I really do treat this blog and its recipe archives as a cookbook/scrapbook for my family. Slowly, slowly, I am getting all of our favorites added in here, and I simply can’t leave this one out. It’s a sweet treat that I made with Mom and my sisters each year when we lived on the farm, and is very much a Christmas tradition in our family. 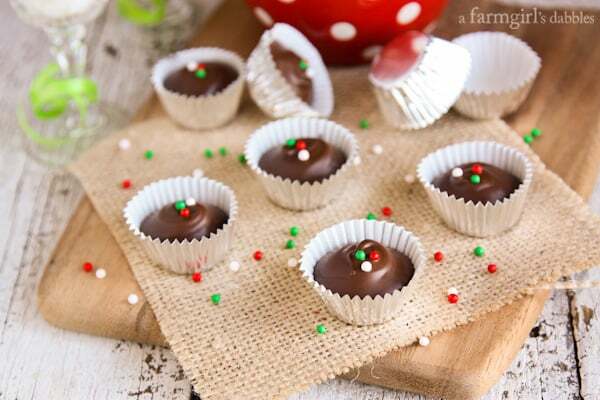 So now that this special recipe is officially in the archives here at a farmgirl’s dabbles, when it’s time to make these next year, all we have to do is search this site for “Mom’s Homemade Peanut Butter Cups”. Cool, huh?! With only 4 ingredients (plus sprinkles, if you so desire), these peanut butter cups are super easy to put together. All you need is peanut butter, powdered sugar, butter, and almond chocolate bark. I do like to add just a bit of bittersweet chocolate to my chocolate bark coating, which is shown here. It gives the chocolate flavor a bit more depth, and I like the pretty sheen it offers. My husband, however, is not much of a fan of that bittersweet chocolate addition. Blake prefers all chocolate as close to the milk chocolate variety as possible. With my preference for dark, darker, and darkest chocolate…I think this is a pretty fair compromise. Notice how small these peanut butter cups are. Mom always made these using little bon bon cups, and I think they really are just the perfect size. I experimented with increasing the size just a bit by using mini cupcake liners, but my family did not like them as well. Sometimes it just pays to stick to tradition! I cannot make these peanut butter cups without remembering my cousins Dave and John, and the many Christmas Eves we spent together in the 70’s and 80’s. My mom’s side of the family usually came to our house for Christmas Eve, and Dave and John and their dad and mom would often spend the night with us. We would feast on shrimp dip, oyster stew, meatballs and gravy, homemade vanilla ice cream, and trays of homemade sweets. And Dave and John could always be found hanging around the tray piled with Mom’s peanut butter cups. Knowing how much her nephews loved them, Mom even sent care packages of peanut butter cups to them while they were in college. Not many people can pass up a peanut butter cup. Personally, I’d take these over the orange packaged ones found on the candy rack any day of the week. And I don’t think it’s about saving tradition or my mom’s feelings. These are just plain awesome! In a medium bowl, combine peanut butter, powdered sugar, and butter. Place in refrigerator for an hour to chill. Then roll mixture into balls, about 5/8” in diameter. Place the balls in the bottom of a 9” x 13” pan, in a single layer, and refrigerate for 30 minutes. In a medium bowl, melt almond chocolate bark (and bittersweet chocolate, if desired, for a little deeper chocolate flavor) in short intervals in the microwave, stirring at each interval. Take care to not let it scorch. You could also use a double boiler for this. Let melted chocolate bark cool a bit before proceeding. Then place a bit of chocolate bark into the bottom of up to 6 bon bon cups. Gently top each chocolate layer with a peanut butter ball and then add more melted chocolate bark to cover the peanut butter balls. 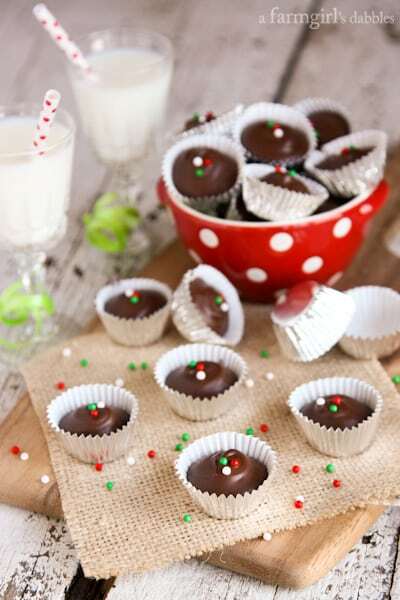 If topping with sprinkles, decorate these 6 peanut butter cups now, before the chocolate bark sets. Then proceed with creating 6 more, and so on, until completed. These freeze extremely well. Just separate layers with wax paper. Adapted slightly from Mom’s recipe box. I love the retro pictures as much as I love your Homemade Peanut Butter Cups. I am all over these. Peanut butter cups are my favorite! 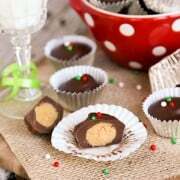 I love homemade peanut butter cups! They are about ten times more delicious than the packaged ones. I don’t usually like Reese’s because it feels and tastes so greasy. These little peanut butter cups are adorable! The peanut butter cup look so cute. I once ate the store bought peanut butter cup and it was tasty. I am aspiring to make my own peanut butter cup. Thanks for sharing. Your mom’s peanut butter cups do look perfect! And I love the old family photos! Merry Christmas Brenda! The cute little sprinkles on top really dress them up for the holidays. 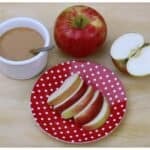 I use my blog as a recipe archive for my family too. I love PB cups, these are so cute! I absolutely love PB cups! 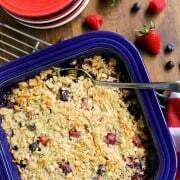 The home made recipes usually include Graham cracker crumbs (not my idea of tasty) or rice cereal (better but not great). Can’t wait to try this recipe. I’m sure it’s perfect. I made some peanut butter balls last night Brenda! I did not use holiday colored sprinkles, like you did. But good minds think alike. I love homemade peanut butter cups and agree that they are so much better than the ones you can buy at all the stores and gas stations in the orange wrappers. I wondered how you go the chocolate on so thickly? I have never used the chocolate bark, so that might be the difference. LUCKY you, your family loves dark chocolate!! I think the chocolate bark has alot to do with the thickness. It’s more of a candy coating, so has great coverage. I like to use a combination of chocolate bark and dark chocolate chips…best of both worlds! I still remember the old check boxes full of homemade peanut butter cups. 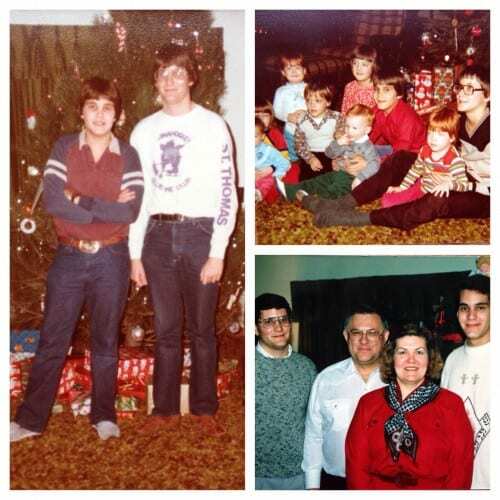 Christmas Eve at your house was always fun!!! Did Billie make you some?! These definitely look perfect! Yum! they’re gorgeous! and I think I might just HAVE to make these. Pinned this to my Dessert board. Looks excellent but … what is almond chocolate bark? Is it a grocery store item I’ve just missed? Hi Jessica – you’ll find it next to the chocolate chips, etc. in the grocery store. It is sold in a small tray of cubes. It is a candy coating, known for its meltability and stability. Love what you did with the post, Brenda. Precious memories! Loving those reto pictures of your family. They look like a million I have of Christmas’s gone by! So many good memories. 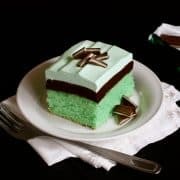 I am so making these this weekend just in time for the holiday. Love the simplicity of these. Thanks so much Brenda! Love the throwback photos Brenda! We just found our family stash, and I almost passed out from laughing so hard. Treasured family recipes really are the best! Mom recipes are alway, always the best! The peanut butter cups look amazing!